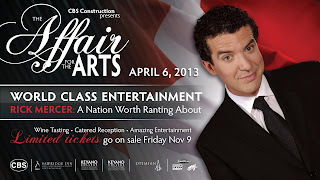 After we announced that Rick Mercer would be returning to Fort McMurray for Keyano Theatre and Arts Centre's annual fundraiser - The Affair for the Arts presented by CBS Construction - we went back in history to the last time he was here, walking the sidewalks of Franklin Avenue with Mayor Melissa Blake. That was late fall of 2005. So much has changed in those seven years. The iconic Oil Sands Hotel is no longer operating and soon will be torn down; Megan McKenny has long since left the radio business; the average income is much higher than $90,000; and Stephen Harper did indeed form a government. So, it was time we took Mr. Mercer up on his offer to come back. 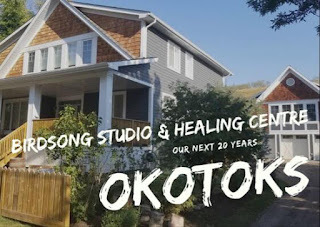 Two important things have changed with this annual celebration and fundraiser. 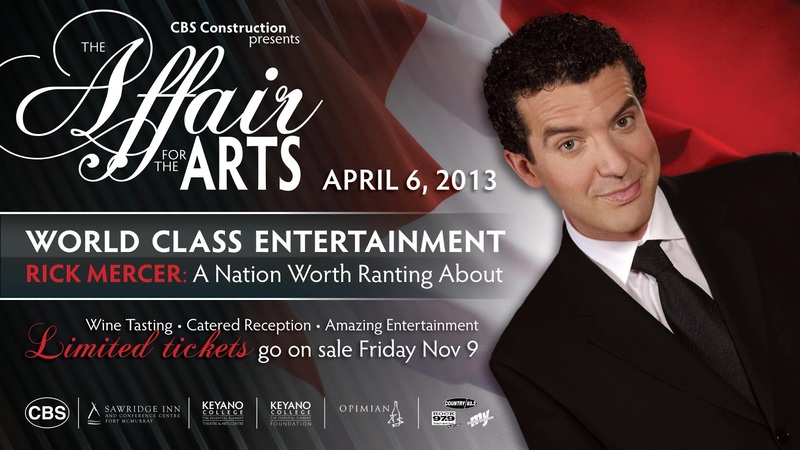 First, the Curtain Raiser has been re-named The Affair for the Arts. Second, the event is scheduled for April 6, 2013 almost a month later than it has traditionally happened. I am absolutely thrilled at the new date because I have missed every single previous fundraiser: Ben Heppner (2008), Moscow Ballet (2009), Vox Lumiere (2010) and Shumka (2011). Each year, I was in a different American city attending the National Council for Marketing and Public Relations (NCMPR) national conference. That night, guests will arrive to a spectacular wine tasting event (featuring 30 vintage wines), an exclusive silent auction, pre-show performance by some amazing emerging Alberta artists, the feature performance by Rick Mercer, and a post-performance performance and party, all of it catered by the incredible culinary artists at the Sawridge Inn and Conference Centre. It will be an outstanding evening of great food, drink and company, plus lots of laughs, all in support of the arts. Here's what is happening with tickets. A limited block of 200 seats will be released for sale on Friday morning (Nov. 9, 2013) at 9 am. 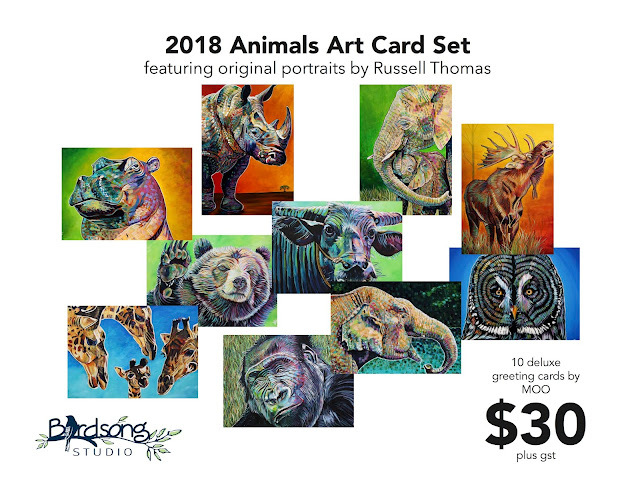 They are $200 each. I would suggest purchasing online at www.keyano.ca/theatre. Press the BUY TICKETS NOW button on the right hand side and away you go. Few people know Canada like Rick Mercer knows Canada. Unashamedly proud, fiercely skeptical, and endlessly entertaining, Mercer knows the people, the culture, the passions, and the heartaches. He knows Canada is a country worth laughing about, cheering about, and occasionally getting angry about -- usually around the time of a federal election. In this new keynote, Mercer pokes and prods at our institutions. He reveals hypocrisy at the highest reaches of power. And he draws our attention to hardworking, unsung heroes. 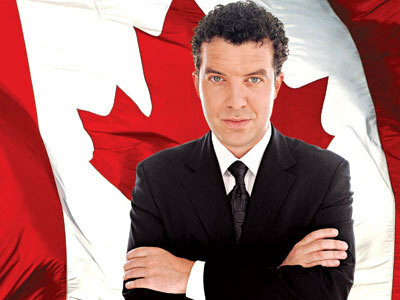 In the process, he illuminates everything that's great and irreverent about Canada. 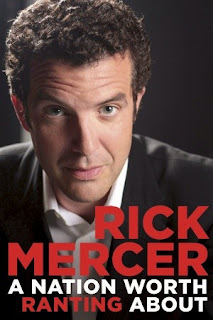 Mercer's unrivaled genius is his ability to make you laugh at, question, think about, and, most of all, appreciate this glorious country we all share.